Why they didn’t go with the title jObs is anyone’s guess. At the end of the film, we see a comparison between the actors and the people they played, none of whom are credited. And despite spending two hours with these fellows, there aren’t many you could name. Cliched as it is to say, but that’s a metaphor for the entire film — it’s so concerned with covering all the major events in the history of Apple Computers and simply the looks of its founders and key people that it misses the mark giving the viewer a sense of what made founder Steve Jobs tick. It’s too bad the film likewise peaks in this scene. We flash back to Jobs’ college years where we’re told he’s a renegade, a rebel, the guy who doesn’t wear shoes and drops acid and casually mentions to a fling that he has a girlfriend He takes a hit in a field with his girlfriend (Amanda Crew) and after copious amounts of dancing, he lies back, restless. His girlfriend queries, “You’re thinking about your parents, aren’t you?” a tear rolls down Steve’s cheek, and the audience laughs. If you get the clumsy baseball references in the title than you get that this weekend was won by 42. 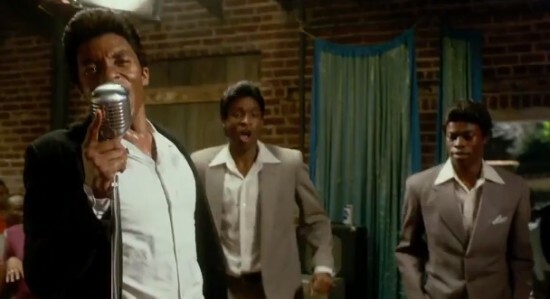 The Jackie Robinson biopic earned an estimated $27+ Million, giving the film one of the strongest baseball movie debuts of all time. The film took advantage of perfect timing and well delivered advertising to get out of the gate strong. Despite the impending the parade of competition, the new baseball season should continue to allow the film to stay relevant for a few more weeks than it really should. Bombing into second place is Scary Movie 5 which managed to pull in $15 Million, and providing tangible proof that no one cares about the spoof franchise any more. If any one is a victor in this instance it would be the Wayne’s Brothers. They conjured up the franchise with the first brilliant film, but eventually parted ways by the third film. The brothers Waynes got back into the horror spoof game earlier this year with A Haunted House, which shines an even larger light on Scary Movie 5‘s failure. Sticking in third place is the newest hit from Dreamworks, The Croods. Easing a very light 36%, the film brought in another $13 Million giving the film a total haul of nearly $150 million, which is huge for a new animated IP from a studio with a mixed track record. There still remains scant children entertainment competition in the upcoming Box Office calender, so the film should still perform well in the coming weeks. Every year there are certain cinematic trends. This can manifest in a couple different ways, one such way is the return to popularity of the Bow and Arrow this year. Another way this manifests is two movies with similar core concepts get released in close proximity. Like Dante’s Peak & Volcano or Armageddon & Deep Impact, these cousin films share a lot in common on paper. 2012 looks like it might have finally found it’s pairing, Abraham Lincoln: Vampire Hunter & Lincoln. A relatively ballsy spot to place this movie on the calendar. A Spielberg biopic about Abe Lincoln starring Daniel Day-Lewis could very well be a financial hit as well as a critical darling, but opening limited on the day Skyfall is released and wide the same day as Twilight: Breaking Dawn Pt. 2 seems to really limit its potential audience. It is true that the winter season is loaded with high-profile films, but this seems like a bad move on the part of Dreamworks. Unless of course all they care about is Oscar posturing. In that case this is a potential smart move to let this movie’s quality seem even greater by comparison of the big blockbusters it is up against. In any event, we now know when Lincoln hits the screens in the states, and truthfully we here at The Flickcast are eager to see it. Lawrence of Arabia (1962) is one of the greatest films ever made and a tie for my number one favorite film alongside Dr. Strangelove (1964). It is one of director David Lean’s most lasting legacies in Hollywood and a truly epic one-of-a-kind film. It was a film that was the inspiration to future filmmakers Steven Spielberg, Sam Peckinpah, Martin Scorsese, and George Lucas. I first saw the film at the age of twelve when my father took me to the Ziegfeld Theater in New York City in 1989 for the film’s restored re-release. My father told me that it was his most favorite film and that I was very privileged to see it on the big screen. I will never forget when the lights dimmed and Maurice Jarre’s score played before the opening credits of the film. It was the first film that I can remember where my eyes were completely fixed to the screen in fear that if I turned away for a spilt second that I might miss a pivotal moment. As I began rummaging through the popcorn bag, I looked over to my father who smiled and gave me a wink. My experience seeing the film on the big screen was like for so many others, a film, which made me want to become a director and it solidified my love of cinema from that moment forward. One of the most intriguing films currently filming is Hitchcock. The movie that tells the tale of the making of Psycho, arguably Alfred Hitchcock’s most famous work. Sir Anthony Hopkins plays the titular director and before now it was hard to really envision the famous actor as the equally famous director. Then People Magazine released this picture. Wow, that has to be the penciled in favorite for best make-up at the 2013 Oscars. He looks amazing in one of the most recognizable silhouettes in cinema history. Hitchcock is fast becoming one of the must see films of next year with an all star cast that includes Hopkins, Jessica Biel, Helen Mirren, Scarlett Johansson, Danny Huston, Toni Collette, Kurtwood Smith and Michael ‘flipping’ Wincott! That is a must see cast, and considering they are telling the story of how one of the most iconic and important films ever made came to be, it is easy to get excited. Of course as famous as Hitchcock’s visage is, his voice is also very specific, so it will would still behoove us all to wait on the first trailer before we set our final expectations. The film is directed by Anvil! The Story of Anvil director Sacha Gervasi, and is set for release some time in 2013. 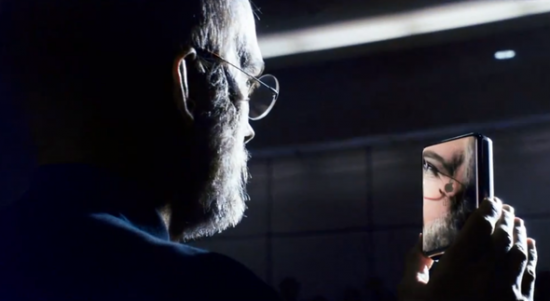 When Steve Jobs passed last year there seemed to be a big push to commit his life story to film. Job’s story is incredibly interesting, and he eventually was a key contributor in many cultural milestones. The King of Twitter is now the King of Apple, as “Two and a Half Men” star Ashton Kutcher is attached to play Steve Jobs in the indie pic “Jobs,” which Joshua Michael Stern (“Swing Vote”) will direct from a script by Matt Whiteley… The film will chronicle Steve Jobs from wayward hippie to co-founder of Apple, where he became one of the most revered creative entrepreneurs of our time. At first glance Kutcher seems an odd choice to play one of the most beloved CEOs of our time, but when you really think about it could be an inspired choice. Kutcher has a pretty obnoxious personality, but he is a capable actor who certainly looks the part. Jobs is only one of several Steve Jobs related projects that are trying to see the light of day, so snagging a big name actor to star is a good first step in making the independent production relevant against other larger profile competition. Moneyball was a great film and it was very interesting to watch Jonah Hill stand toe to toe with Brad Pitt and deliver Aaron Sorkin dramatic dialogue like a pro. So the news that he has signed on to a new dramatic feature is exciting. Deadline is reporting that Jonah Hill will be joining forces with James Franco, himself another actor fully capable in drama or comedy, for the upcoming film True Story. A film about a New York Times journalist who’s identity had been stolen by a wanted murder while on the run from authorities. Like Moneyball, this is another opportunity for Hill to veer from his comic persona. He will play Finkel, who was a writer at The New York Times Magazine in 2002 when he learned that Christian Longo was captured in Mexico after a long stint on the FBI Ten Most Wanted List for killing his family. The strange part was that he had been living under the identity of Finkel. The very next day, the real Finkel was fired by the editors of The Times, right after they ran an editor’s note declaring that he had falsified parts of an investigative article. His career seemed over, until Longo (who’ll be played by Franco) declared that the real Finkel was the only journalist he would talk to. Sounds very interesting, hopefully we are just getting to meet a whole new side to Jonah Hill.